This is what it looks like from the other side of the camera. 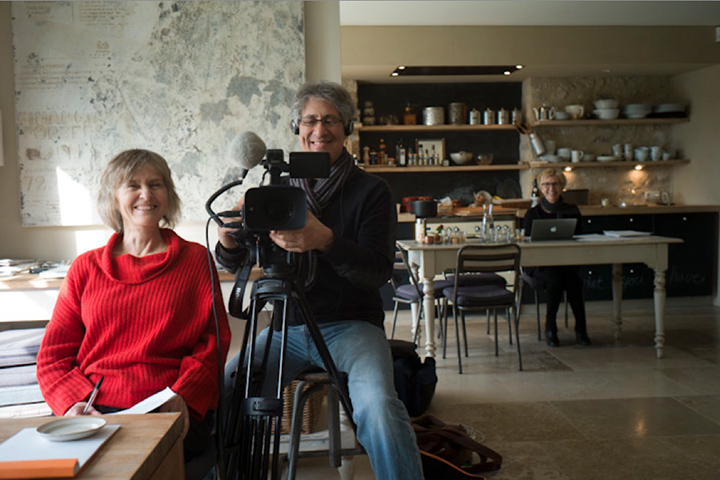 I was being interviewed and filmed by the BBC for a documentary on Vivian Meier. I had been involved with her work almost from the very beginning, because, when John Maloof discovered what he had bought, and began asking for opinions from a number of photographers about the quality of the work, he called me, and I said, “she’s the real thing’! I contributed to this BBC version because a friend was the producer of the film and I couldn’t say no to him even though I had already been filmed by John. It all worked out in the end and John’s film has brought a lot of attention to the work, which is the best result possible. But as I sat there facing them I had the impulse to make a record of the moment, since it was one of the parts of the day that seemed worthy of remembering. It’s a record, more or less of who was there, how the place served us, and what life in Bonnieux offered. It’s what photography can do in its simplest, most utilitarian way. This entry was posted in Uncategorized and tagged BBC, Bonnieux, France, Interior, portrait, Provence on February 26, 2015 by joelmeyerowitz2014. “This is what it looks like from the other side of the camera. I was being interviewed and filmed by the BBC for a documentary on Vivian Meier.” Great — I’ve been hoping for better films about Vivian Maier. I thought your part of the Maloof film (the one nominated for Oscar) was just about the best thing in that film and that otherwise they could have done a lot better. Looking forward to seeing this one you’re in about her, and to many more great films on her. I’d be glad to tell your filmmaker film what I’d suggest for better Vivian Maier films and coverage. … Just enjoyed seeing the exh of prints she made herself at HGG.